EDIT 04/10/13: Video has been removed by the user. My apologies! This week’s video presents the TV movie Nightside (1980) in its entirety, apparently the pilot for a series that never materialized. Timothy first appears at about 1:03:30 as Slowboy, an ill-tempered pimp strung out on coke. After being talked about the whole movie, it’s a bummer that Slowboy only gets about 3 minutes total screen time. Television legends Bernard L. Kowalski (director) and Stephen J. Cannell and Glen A. Larson (writers and executive producers) were at the helm. This entry was posted in Television and tagged bernard kowalski, glen a. larson, nightside, stephen j. cannell, timothy carey. Bookmark the permalink. Stupid noisy background music almost ruins this clip. 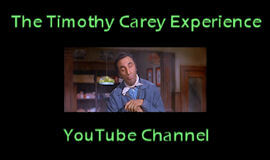 Another instance of Timothy Carey looking very much like Christopher Lee. Yes, too brief a role but not a bad one. I checked the IMDb cast list and Vincent Schiavelli is in this movie, too. It would have been a treat to see him and Timothy together in a scene. Schiavelli’s role in Ghost (1990) is somewhat Careyish, I think. I heard and read about this pilot. I’m glad someone finally posted it on YouTube. It’s a treat to see two legends like Glen A. Larson and Stephen J. Cannell work together. I read somewhere that the reason this show didn’t turn into a series was because when it aired it went up against the Tony Awards that same night. It would have been nice to see this show move forward. But sometimes in life things aren’t meant to be. Well K.J., I’m glad you caught it, because it looks like the video has been “removed by the user.” Phooey!! Yes, I think this would have made a fine series as well. Doug McClure’s impersonation of Burt Lancaster was actually pretty good, if pretty scary too!